The SM Store Win an Audi A3 with MasterCard ~ Philippine Freebies, Promos, Contests and MORE! 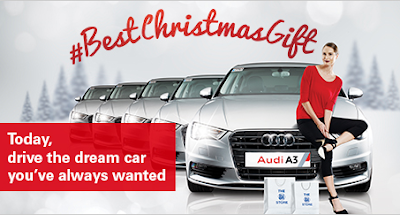 This holiday, receive your #BestChristmasGift by joining The SM Store Win an Audi A3 Promo. Every P5,000 single-receipt straight and installment transaction from The SM Store using your MasterCard, you will be entitled to one (1) raffle entry. Collect as many entries as you can for more chances of getting picked in the electronic raffle draw. Five (5) very lucky winners will each drive home an Audi A3 2.0 TDI car. You will be notified by phone and registered mail on how to claim the prize. Regardless of how many times your name is drawn, you can only win once in the entire promo. Also, you will shoulder the 20% prize tax, car registration and other expenses related to the prize. Five (5) winners of brand new car!